Recently, we examined our current files to determine the incidence of narcotic addiction in 39,946 hospitalized medical patients who were monitored consecutively. Although there were 11,882 patients who received at least one narcotic preparation, there were only four cases of reasonably well documented addiction in patients who had no history of addiction. The addiction was considered major in only one instance. The drugs implicated were meperidine in two patients, Percodan in one, and hydromorphone in one. We conclude that despite widespread use of narcotic drugs in hospitals, the development of addiction is rare in medical patients with no history of addiction. Jane Porter; Herschel Jick; MD Boston Collaborative Drug Surveillance Program, Boston University Medical Center, Waltham, MA. In a more recent June 1, 2017 letter to the NEJM editor, the authors dealt with the broad based and undocumented assumption in the 1980 letter of Addiction Rare in Patients Treated with Narcotics and the realization of the addiction and deaths of many people using Opioids. “from 1999 through 2015, more than 183,000 deaths from prescription opioids were reported in the United States and millions of Americans are now addicted to opioids.” Signed by four researchers exploring the reasons why Opioid addiction and deaths have risen, one of the conclusions reached was doctors being told “the risk of addiction was low when opioids were prescribed for chronic pain.” Supplementary Appendix. 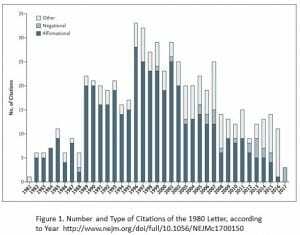 From the 2017 correspondence to the Editor entitled; “A 1980 Letter on the Risk of Opioid Addiction,” the authors, by utilized bibliometric analysis of data derived from the number of citations of the 1980 letter from the date of its publication until March 30, 2017. The authors analyzed the relationship between the 1980 letter and it’s conclusion(s) with other document’s conclusions citing the 1980 letter. The analysis can be seen in Figure 1. 608 citations of the 1980 letter were identified (Figure 1) of the index publication. Also noted was a sizable increase in citations after the introduction of OxyContin (a long-acting formulation of oxycodone) in 1995. 439 (72.2%) authors of articles cited the 1980 letter as evidence addiction was rare in patients treated with opioids. 491 (80.8%) authors of articles did not note the patients described in the letter were hospitalized at the time they received the prescription and left readers to assume these were out-patients. As an aside to the citation of the letter, some authors grossly misrepresented the 1980 letter’s conclusion(s) in various comments as shown in Section 3, Supplementary Appendix. In comparison to the 1980 letter citations, the researchers also compared the number of times other letters published in the NEJM were cited: “11 other stand-alone letters taken from the same time period were cited at a median of 11 times.” To be redundant, the 1980 letter was cited 608 times. As I have been doing my research on another piece to which this is almost a prelude to it, I have found an overwhelming resistance to any type of control being placed on prescriptions for Opioids of which there are limitations on the number of days a prescription is given for short term pain. The naysayers always go back to the issue of chronic pain. The resistance to quantity limitations of Opioid prescriptions for non-chronic pain can be felt strongly in both state and federal legislatures by pharmaceutical companies lobbying. In a ten-year period from 2006 to 2015 Pharmaceutical companies have spent $880 million in lobbying all 50 state legislatures and in making campaign contributions in an effort to prevent laws restricting Opioid prescription quantities. In the end, it is just a matter of profits disguised as concern for chronic patient pain care. Seems like the FDA screwed up as well. Let me just say as a pancreatic cancer survivor who has been taking Opiods regularly to control severe chemotherapy-induced neuropathy: without the drugs my life would be a living hell of persistent pain severe enough to make me essentially fully disabled. With them I am at least able to function relatively normally. Even large doses of Gabapentin–the usual non-opiod prescribed to neuropathy sufferers–makes only a slight dent in my symptoms. My prescriptions are written by a pain management specialist who works for my oncologist’s office who sees me every three months to monitor me and make sure the drugs are not unduly affecting me. In other words, it IS possible for these drugs to be administered responsibly. Unless you have been in chronic pain yourself –the kind so bad that you can’t even get a decent night’s sleep–you really have no idea what it is like. It NEVER goes away. No matter what you are doing, it is there to make you miserable. Personally, if I didn’t have the relief the Opiods provide, I would have preferred if the cancer would have just gone ahead and killed me. The fight was never over chronic pain. Opioid advocates have been making it a fight over chronic pain by calling it up every time there is a push to limit quantities of opioids going to people with injury and surgical induced pain. Opioids never did anything for me other than give me a headache leaving me still to contend with pain. I hope you feel better. Having been fileted on both sides of my body, I felt some excruciating pain until I healed. Shouldn’t opiates be used by people who benefit from them, like Karl, and not by people who don’t benefit from them like Run? A good pain management system should be able to,tell the difference. Blanket restriction is not the easy way out and does not serve those in severe pain who benefit from them. It is a good question to ask. I think you should research it. In my next post there will be plenty of citations. The fight to limit quantities was never about chronic pain. Some have made it a battle using libertarian views and infringing upon their freedom. You would be surprised what I have read. Without researching it, I would guess it is about money. Everything seems to come down to either money or power. Despite the obvious mfg’er’s and distributor’s marketing costs to maximize sales (thus profits), there must also be a major culpability among physician’s to continue prescribing opioids knowing addiction has occurred. Ultimately physician’s are the State’s responsible authorizing entity are they not? I can understand a physician’s pecuniary interest in not losing a patient to another physician, and thus perhaps continuing to prescribe, but that can only apply if there is an ample supply of physician’s as predators who, in the composite will prescribe without restriction. It may also be that mfg’ers have underground distribution channels they tactfully declare they have no control over which would also mean there is insufficient State control & enforcement for prescription drug sales & unauthorized distribution. Somehow this smacks more like massive corruption in the pharmaceuticals and medical professionals industry, supported by State oversight agencies (on the take one way or another). In the capitalist for-profit enterprises, the mfg’ers’ job is to sell as much of their product as possible to maximize roi. When their sales are limited by who are authorized to purchase (e.g. distributors and physicians) as middle men, and those authorized purchasers are not controlled by the State to enforce the restrictions, then it seems t me that ultimately the State agencies charged with enforcement are the primary source of the problem. Those State agencies can only excuse themselves by citing “costs of enforcement” which ultimately comes down to what the State must charge the mfg’ers in surtax or fee’s to cover costs of enforcement. Of course that reduces mfg’ers profit margins so they will always oppose those surcharges or fees which is a perennial given. Thus to avoid reductions in margins they have to increase prices which cost patients (health insurance company’s) more and thus they are also opposed to charging for adequate enforcement costs. In fact addiction serves everybody’s interest’s but the patient’s and thus the State is the only entity to intervene on the patient’s behalf. This all boils down to the State failing to protect their public’s interests and being hostage to the pharmaceutical mfg’ers, distributors, and medical profession interests. In a nut-shell a complete failure of the system of government employed. After my hip was replaced I was given OxyContin without anyone telling me what this pain killer really was. When I learned I fortunately got off this garbage and just endured the pain. Fortunately for me the surgery and therapy afterwards was a success and I did not get addicted. But I am still very annoyed that an addictive substance was ever in my body. People – ask you doctor about everything they give you. Sometimes doctors don’t tell you they are giving you a strong opioid, especially a strong one like morphine, so that when you start to go through withdrawal you don’t make the connection to the drug and are not tempted to try to obtain it. Psychological versus physical addiction to heroin: my early 1970s observations while temporarily ensconced in the “pre-detention center” down the block from Washington Square Park, formally known as the The Village Plaza Hotel at 79 Washington Place, NY. The key tip off of the psychological condition of the users who were out robbing every day to feed their habit and — what I called the grocery bag junkies who just came to play with heroin on the weekend — was that you quickly learned not to note that the street junkies were nodding off OR the next three times they encountered you (literally) they would rush up to insist they just “hadn’t slept in three days” (regularly). Around that time I was on a temp job as a trucker’s helper, three weeks transferring stock from a main medical warehouse to a satellite. We all agreed the job was fun; except we all agreed when the supervisor came over to the satellite; whom we all agreed was the nicest, sweetest, easiest going boss you could ever have (able to remember him that way for some reason 45 years later); but when he was there we were doing the job for him, not for us which spoiled the fun we all agreed. These street junkies were very ill individuals emotionally (maybe not your typical Oxycontin abuser — worth a look to see) — especially in paranoia. I figured they couldn’t enjoy anything with all of us “supervisors” ready to “jump on” everything they do — so they escaped we supervisors with opiates (sever alcoholics may be the same) just to enjoy life as we do. Iow, it wasn’t the direct pleasurable effect of the drug that trapped them in addiction — I knew it wasn’t the physical addiction because these guys kicked cold turkey on a schedule; as your body adjusts to today’s dose you have to shoot more nest stage to get the same high; has to stop somewhere; then you kick cold and start all over from the bottom. I figured it was the psychological addiction that held them. No use going through cold turkey today when you are going to want more scag tomorrow — because you can’t enjoy life without it. “Insufficient State control & enforcement for prescription drug sales & unauthorized distribution” can be attributed at least partially to interference by Congress: https://www.washingtonpost.com/graphics/2017/investigations/dea-drug-industry-congress/?utm_term=.c714c4728144. Pharmaceutical-industry-friendly Members of Congress, led by Rep Tom Marino of Pennsylvania (who was nominated by Trump to be our next drug czar but withdrew after these events became known) and allied with major drug distributors, pushed through a law preventing the DEA from freezing suspicious drug shipments, a tool that had been effective in the past. The Sacklers should be put in prison. The Fed’s authorize legal pharmaceuticals, their authorized uses, limits of dosages (mg/unit time (daily)), and even age limits if they so chose. and they control interstate pharmaceutical sales & transfers. Once the drugs are in a state the State has jurisdiction over physicians licensing and standards as well as all business’s licensed in their State… of which pharmaceutical sales sources and distributers within the States are included. There really is no reason for the Feds to tighten restrictions other than the fact that this will then override the States failures to do anything. The graft and corruption are occurring within the States jurisdictions. This is one of those “States Rights”. I don’t know why the States don’t exercise their jurisdiction to control but I surmise it’s because of the powerful physicians Union (AMA), and kick-backs and sweet-heart deals in various forms between State legislators and their primary constituents (funders) in the health care businesses — private for – profit clinics owned by doctors and insiders who send their patients to their own clinics for various treatments is one I’m familiar with in CA. I’m sure some States do more to control and enforce than others, but it’s ultimately a corruption at State levels that allows the addictions to occur. As I said in my prior not it’s to every stakeholder in every State’s economic advantage except the patients’ themselves for “legal” addiction to run unabated. Mona, your Washington Post link is pay-walled… so I wasn’t able to read it (I don’t pay for internet news from public news sources … or any other pay-walled information). Sigh, I got right into it. Think they know me as an important person? Probably not! Just google it if you can not get in. A lot of times someone else puts it up. It is from 2017. Are you saying that the opioid problem is due to a lack of government regulation and control? Run, thanks… got it now. I should have googled it myself … my bad. I conforms my own assessment of massive corruption. But biologically and psychologically, anything which makes people fee better (in either or both respects) is what humans will endeavor to consume.. If for some reason those beneficial effects also lead to addictions which reduce or reverse the benefits, either individually or collectively within a society, a limit must be imposed. Unfortunately, among all animal species, individuals are not all biologically or psychologically capable of exercising or even knowing the limits required — this is not “their fault” but the fault of their genetics and circumstances both of which are beyond their direct control This is well understood among animals, including the so called “intelligent” human animal.. It is fort this reason that political ideology and economic factors come into play. Those who view laissez-faire and individualism as supreme will have a different solution than those who take a cooperative view of societies.. So, in terms of the political and economic aspects, is that a yes?